Histological techniques 2. Fixatives. Atlas of plant and animal histology. There are many fixatives described in the histological methods books. In this page, the most common fixatives used in histology labs will be mentioned. These have being proved as the most suitable for a better preservation of the tissue features. Chemical fixatives are the most frequently used, either as a single component or as solutions containing several fixatives. Considering the mechanism of fixation, fixatives can be classified in two types: coagulant and cross-linking. Coagulant fixatives remove water from tissues leading to coagulation and denaturalization of proteins, mostly in the extracellular matrix. Cross-linking fixatives form chemical bonds between molecules of the tissue. Alcoholic fixatives are coagulants, such as Bouin and Carnoy, whereas formaldehyde and glutaraldehyde are cross-linking fixatives. Sometimes, a mix of the two types of fixatives is used. Fixatives are also classified as additive and non-additive. Additive fixatives combine with molecules of the tissue so that the fixative, or some of its components, becomes part of the tissue and it is processed in the following steps of the histological protocol. They are mainly cross-linking fixatives and some coagulant fixatives. Non-additive fixatives, once performed the fixation, are remove from the tissue in later steps of the tissue processing. Alcohol and acetic acid are examples of non-additive fixatives. Warning! Most of fixative solutions are toxic by inhalation or skin contact, some of them are carcinogenic. It is important to follow the safety guidelines for manipulating these substances. Ethanol, methanol and acetone. Their fixation mechanism is by dehydration and coagulation of proteins, mostly cytosolic proteins. The lipids are extracted from tissues, but carbohydrates are nor affected. Methanol is better fixative than ethanol because the tissue is not hardened and is better preserved. In general, they are good fixatives for small size samples, for preserving proteins, like enzymes, glycogen and some pigments. Blood smears and frozen tissue sections from unfixed samples are usually fixed with these fixatives. Since they do both dehydration and fixation at the same time, they can be used for preserving the samples. However, as a drawback, they normally produce hardening and retraction in the tissue, and lack mordant effect. Acetic acid. The effect of acetic acid on tissues is not a direct fixation, but a change of the colloidal state of proteins. Acetic acid is used at a concentration of 1 to 5 %. It is a very good fixative for nucleic acids and nucleoproteins. As drawbacks, acetic acid destroys mitochondria and does not fix well membranes and cytoplasm. It is commonly combined with other fixatives like Bouin (formaldehyde + acetic acid + picric acid) and FAA (formaldehyde + acetic acid + ethanol). In some fixative solutions is used to counteract the artifacts that may cause ethanol or picric acid..
Zinc chloride and zinc sulfate. As a fixative, zinc salts were used long ago, and later they became a component of several fixative solutions. Currently, they are combined with paraformaldehyde. They help paraformaldehyde with the fixation and preserves tissular antigens for immunohistochemical techniques by minimizing the antigen masking effect of paraformaldehyde. Mercury salts, which were used in the first fixative solutions, have been replaced by zinc salts. Fixatives containing zinc salts are not prepared in phosphate buffer, as it is common for other fixative substances. Furthermore, after fixation, zinc has to be removed from sample with thorough washes in distilled water. Picric acid. The fixation by picric acid is mediated by the coagulation of proteins produced by the picrate salts. Normally, 2 % to15% of a saturated solution of picric acid is combined with other fixatives. When the fixation time is set properly, picric acid is a good fixative for preserving the cellular structure, as well as glycogen and lipids. It has mordant effect, which is needed for some dyes of several post-embedding staining methods. It is a good practice to wash thoroughly the samples to remove the picric acid before paraffin embedding because picric acid makes difficult the infiltration of paraffin. Bouin is a widespread used fixative containing picric acid. Formaldehyde. It is a widely used fixative because it provides a very good structural preservation for tissues, conserves tissues during long periods of time, produces small tissue retractions, is compatible with most techniques and histological staining procedures, including immunostaining and in situ hybridization of mRNA. 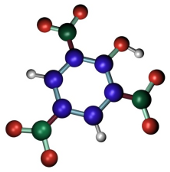 Formaldehyde bonds to functional groups of proteins and renders hemiacetal groups. This makes most enzymes non-functional, preventing the degradation of tissues by hydrolytic enzymes. Formaldehyde bonds to several types of groups like ammino, sulphydryl, guanidyl, and aliphatic hydroxyl groups. 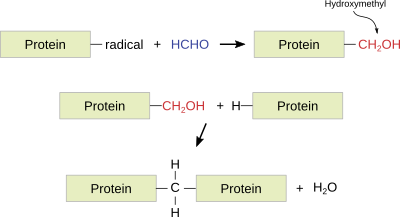 The reaction produces hydroxymethyl compounds, which react with other groups, either located in the same or in a different protein, to form methylen bridges. Formaldehyde is a well-preserver for lipids, which is improved by adding calcium to the fixative solution because calcium minimizes the solubility of phospholipids, and it does not react with carbohydrates. Formaldehyde fixation time is 24 to 50 h, although it can last for 1 or 2 weeks. If the tissue is intended for immunohistochemistry, a 12 to 24 h fixation at 4 ºC is recommended. Long lasting fixations harden the tissue and may cause nucleic acid instability. The fixative can be partially removed from the tissue by long washes. Formaldehyde is commonly used in buffered and isotonic solutions at a concentration of 4 %. Nowadays, formaldehyde is usually prepared from the solid compound paraformaldehyde. Examples of fixatives with formaldehyde: buffered formaldehyde, Bouin, FAA, PLP. 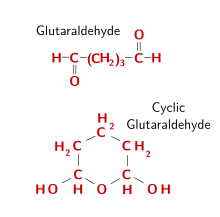 Glutaraldehyde is a widely used fixative. When it is in solution, glutaraldehyde forms dimers and trimers. Aldehyde groups locate inside the polymerized molecule react with the amino acid's amino groups, linking proteins by making molecular bridges. The outer aldehyde groups, however, remain unbound, which should be blocked to prevent false positives, for example when adding proteins like immunoglobulins during immunohistochemical reactions, or to prevent reactions with aldehyde groups during PAS histochemistry. Therefore, it is a good practice to remove glutaraldehyde free groups, usually done with a pre-treatment in 1 % sodium borohydride. The penetration speed of glutaraldehyde is slow, so that fixation by perfusion is recommended. The slow penetration may cause artifacts such us retractions. 0.5 % to 3 % of glutaraldehyde combined with formaldehyde in isotonic buffered solutions is commonly used. It can preserve the ultrastructure of tissues much better than other fixatives, and that is why it is a preferred fixative for electron microscopy studies. However, it is not recommended for paraffin embedding because obtaining sections is more difficult. Several types of aldehydes have been used as fixatives in histology, but they are no longer included in the more common histological procedures. For example, chloride hydrate was used for the fixation of the nervous system, acrolein (very toxic) for electron microscopy, and glyoxal as a general fixative. Chemical bonds between osmium tetroxide and unsaturated fatty acid chains. Osmium tetroxide is one of the first fixatives, used from 1865. It does not penetrate deep in tissue blocks, and samples larger than 0.5 to 1 mm are not recommended. Osmium tetroxide can be used in solution and as a gaseous fixative because it is a volatile molecule. It does not produce artifacts, but renders fragile samples. Chemically, it forms bridges between unsaturated fatty acid of membrane lipids. Thus, cell membranes become insoluble, dark and electron dense (that is, electron can cross them). Osmium tetroxide is commonly used for electron microscopy studies because cell membranes are well-preserved and dark, so that they can be easily observed. At light microscopy, it is useful for studying unsaturated lipid deposits, myelin tracts, and it is needed for silver impregnation procedures like Golgi impregnation method. Osmium tetroxide is not regularly combined with dyes because it is a strong oxidizing molecule and prevents binding of anionic dyes to the tissue. Currently, osmium tetroxide is mostly used after formaldehyde and glutaraldehyde fixation, and before dehydration and embedding for electron microscopy. Nowadays, most fixation procedures include several fixatives, either together in solution or one by one in successive fixation steps. In this way, the advantages of each fixative can be applied to the same sample, and some disadvantages can be balanced. There are many fixation procedures, both in their components, the proportion of each of them, and in the way they are used, depending on the sample and on what we want to observe. Together with the fixative compounds, there are other components in the fixative solution for adjusting other features like osmolarity and pH. For example, most fixatives are dissolved in buffered solutions with a neutral pH so that tissue structures are not much affected. Some substances are also added with different purposes. Thus, ethylene glycol allows freezing the sample and get frozen sections, preventing the protein diffusion as well. The followings are some of the most common fixative mixtures. They show a combination of properties suitable for the observation of a large variety of tissues and staining procedures. Bouin. It is a solution of picric acid, formaldehyde and acetic acid, frequently used in samples for paraffin embedding. The sample sections can be treated for a wide number of staining techniques. It is very useful for soft and embryonary tissues, the nucleus and glycogen are well-preserved. If fixation by immersion, fixation time does not usually exceeded 48 h. After that, samples can be kept in 70º ethanol for a long time. It is not recommended, however, for kidney or mitochondria. Before paraffin embedding, it is advisable removing the picric acid from the sample by long washes in 70º, because picric acid hinders paraffin diffusion, which impedes a good embedding and spoils staining. Clarke solution. It contains ethanol and acetic acid in a 3:1 proportion and was one of the first fixative used. It is good for paraffin embedding. Carnoy. It contains ethanol 100º, chloroform, and acetic acid. Carnoy is a good fixative for glycogen, simple carbohydrates, and fibrous proteins. It also fixes very well nucleic acids, although the nuclear morphology is somehow distorted. The Nissl bodies of neurons are clearly visible after fixation with Carnoy fixative. However, it may produce tissue retractions. Solutions containing formaldehyde. Nowadays, formaldehyde is probably the most widely used fixative for common histological techniques, but also for immunostaining and mRNA in situ hybridization. A concentration of 4 % is routinely used, combined with other fixatives in buffered isoosmotic solutions. For electron microscopy studies, the most popular fixative is formaldehyde combined with glutaraldehyde. Formaldehyde initiates a quick fixation thanks to its faster diffusion rate, whereas glutaraldehyde developes a slower but stronger fixation. Formaldehyde fixation protects against potential tissular retractions caused by glutaraldehyde. Examples of formaldehyde containing fixatives: buffered formaldehyde, Bouin, FAA, PLP. Glutaraldehyde - osmium tetroxide. Fixatives may be used not at the same time but consecutively. Samples for electron microscopy are initially fixed with glutaraldehyde (1 - 3 %) and paraformaldehyde (2 - 4 %), and then by osmium tetroxide (1 %). This combination is good for almost all the structures of tissues, particularly membranes. This is important because the procedure for electron microscopy usually involves dehydration in organic solvents and polymerization in resins at 60 ºC, during which cellular structures must be preserved.